These typical ‘aspirational’ airy-fairy Visions state nothing that’s specific, quantifiable or measurable. There’s no time line, so no sense of urgency, there’s no call to action…and, certainly, there’s no accountability. We may as well hang a picture of someone’s smiling grandmother on the wall. A) Creating a clear and specific ‘operational’ Vision: The common belief is that our Vision is our ‘dream’ of what we want to become. But, in truth, our Vision needs to be a combination of what we want to become (our dream) and the reality of what we must become to be a profitable and responsible market leader in 3 to 5 years. And, if we don’t want to become what we must become, we have a serious problem and some tough decisions to make, generally called ‘Exit Strategies’. If we’re not passionate to become what we must become, it’s time to get out…now. The purpose of our Vision is to inform, focus, challenge and inspire everyone on our team about what we commit to become. It will be created by the management team and will be clear, easy to read and understandable by all. Any Vision that doesn’t do that is missing the point. Our ‘operational’ Vision will guide us in everything we do. It will get “everyone singing from the same hymn sheet”, as my Grandma used to say. That’s what a Vision is for. It will also help us plan for the talent we’ll need to get us where we commit to be and will be an effective recruitment tool when hiring key personnel. Good people want to be with a business that knows where it’s going and how it will get there. Our Vision will consist of six points on one piece of paper and will be updated each year to keep it, and us, current and relevant. The annual update will take a few days each year. Time well spent. Our Vision will lead to commitment, specific action, urgency and accountability. Do we the right business model to get us to our 3 to 5-year Vision? If not, how must our business model change? Do we have the have the people talent at every level of the organization to get us to our 3 to 5-year Vision? If not, what specific talent and experience must we develop from within, or recruit from the outside? Do we have the management and reporting structure to get us to our Vision? If not, how must our structure change? Do we have the working capital required to finance our growth commitment? What amount of working capital will be required each year to create our Vision? What portion of that will be generated by the business and what portion must be raised by other means? Do I, as a current owner, leader, or a manager of the business, have the ability, management style, energy and desire required to effectively help lead this business to its Vision? If not, how must I grow…or what alternate career and / or ownership decision must I make? B) From our 3-5 year Vision comes our annual Mission: So, what’s the difference between a Vision and a Mission? Most Vision and Mission Statements look so much alike that if you blank out their titles, nobody’s sure which one is which. As we’ve just stated, our ‘operational Vision’ will be a clear and measurable 6-point statement of what we commit to become in the next 3 to 5 years. If you don’t like the word ‘Vision’, call it a ‘3 Year (or a 5 Year) ‘Business Commitment’. Let’s not get hung up on terminology. Our Mission, on the other hand, is a clear and measurable statement of what we commit to do, this year, in each part of the business, to move towards our 3 to 5-year Vision. If we don’t do specific things each year, we’ll never get to our Vision. 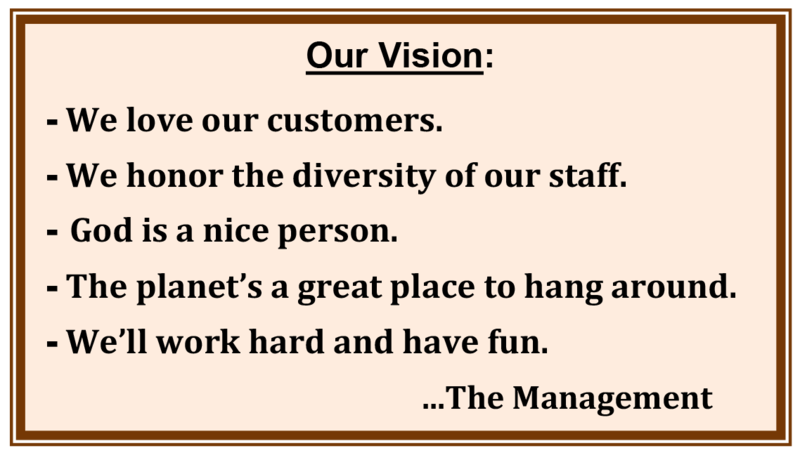 We create a fresh Mission Statement every year. C) Our ‘Commitment to Action’: Finally, from our annual Mission Statement comes a clear and specific ‘Commitment to Action’ for the year. This is a detailed Implementation Plan stating in detail what will be done, by whom, at what cost, by when, measured how. This is the detailed document that makes sure that effective implementation takes place. It is at this implementation phase that so many businesses fail. “Businesses don’t die from a single shot to the head, they die slowly but surely from a 1000 uncompleted tasks.” Our ‘Commitment to Action’ ensures that what needs to be done, gets done…on budget and on time. step process turns our long-term commitments into specific actions that engage everyone in moving the business forward. It is simple, it’s effective …and it can transform your business. 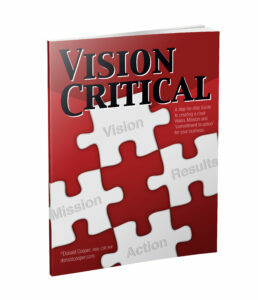 D) Next Steps: For step-by-step help in creating a clear Vision, Mission and ‘Commitment to Action’ for your business, you can access our complete 34-page electronic Vision Critical Guide for just $24. Click hereVision Critical to access it.